A Cardiac (Heart) Transplant may be performed in cases of severe heart failure or when a seriously damaged or defective heart cannot be made to function adequately through medical or surgical treatment. A transplant is most likely to be prescribed when the heart is significantly malformed at birth, when the heart's valves or the coronary arteries are diseased, or when the heart, or part of the heart, is significantly enlarged or damaged. Enlargement of the heart or one of its parts, known as dilated cardiomyopathy, may be congenital (present at birth or developing from conditions that are present at birth), or it may be the result of infectious disease, a heart attack, or some unknown cause. In children, it is the most common reason to be listed for cardiac transplantation. Once a patient has been screened and selected as qualified for a heart transplant, his or her name is placed on a national waiting list for an appropriate organ. The hearts selected for transplant come from people whose brains have stopped working but who have remained on life support so that their other organs can continue to function. The family of the patient must consent to donate the heart and other organs of the body. It is important that the organ selected for transplant be a good match for the recipient in blood type, tissue type, and in other ways. The waiting period for a suitable organ is usually from 1 to 10 months, depending on blood type and other factors. 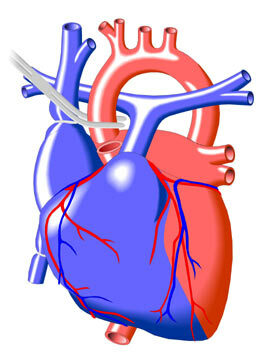 Well over 2,000 cardiac transplants are performed in the U.S. each year. The transplant operation usually takes from four to six hours. During the procedure, the patient's blood is routed through a heart-lung bypass machine, which keeps it supplied with oxygen and moving through the body's tissues.